Who knew Brisbane was such a cool city? 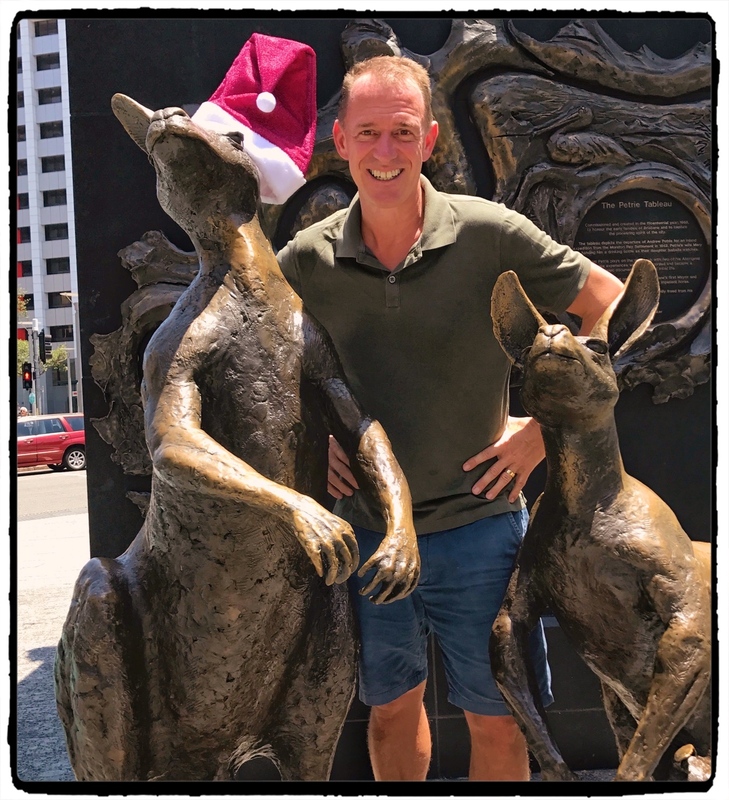 Our fifth stop in Queensland was this huge state’s capital, the biggest city in Queensland and the third biggest city in Australia. To the extent I had any concept of Brisbane before coming here, it was just another spot in Australia’s vast almost-nothingness. Imagine my surprise to find a bustling, lively, cultured city of 2.3 million people. In 2015, in fact, the travel guidebook Rough Guides named Brisbane one of the ten most beautiful cities in the world, citing reasons such as “its winning combination of high-rise modern architecture, lush green spaces and the enormous Brisbane River that snakes its way through the centre.” I’m not sure I’d agree with top ten in the world, but it is surely a beautiful city. Brisbane was first settled by Europeans in 1825, when Sydney – itself a penal colony – needed a subsidiary colony for repeat offenders. In other words, the really bad apples. The number of prisoners quickly grew to over 1,000 men who were subject to harsh punishments; while officially the number of lashes was limited to a maximum of 50, Captain Logan regularly applied sentences of up to 150 lashes. Harsh. 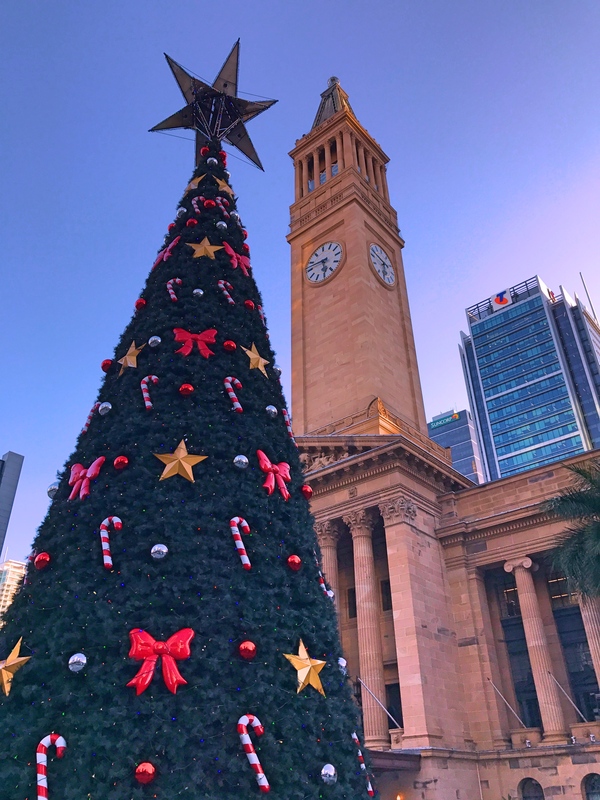 Today Brisbane is a lively city defined by the meandering Brisbane River which, through its winding turns, creates a myriad of cute little neighborhoods with different styles and personalities. Needless to say, over four days we only scratched the surface of what Brisbane has to offer. And just what does it have to offer? 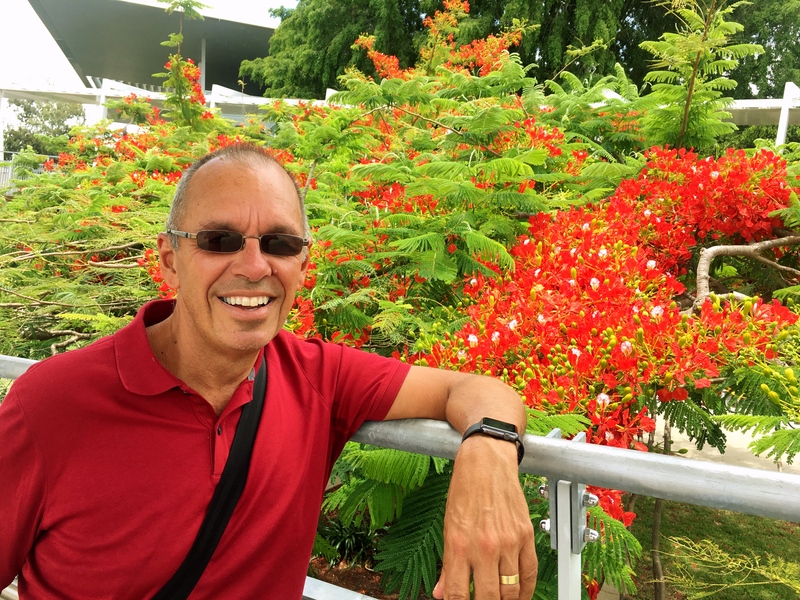 Besides just walking along the river, itself a lovely way to spend time, the two highlights for me were the city’s Botanical Garden and Gallery of Modern Art (GOMA). Oh yeah, and a great (and cheap) Greek restaurant. I was surprised after we’d left Brisbane how few photos we had of the city’s beauty. This shot from the Botanical Gardens will have to suffice. 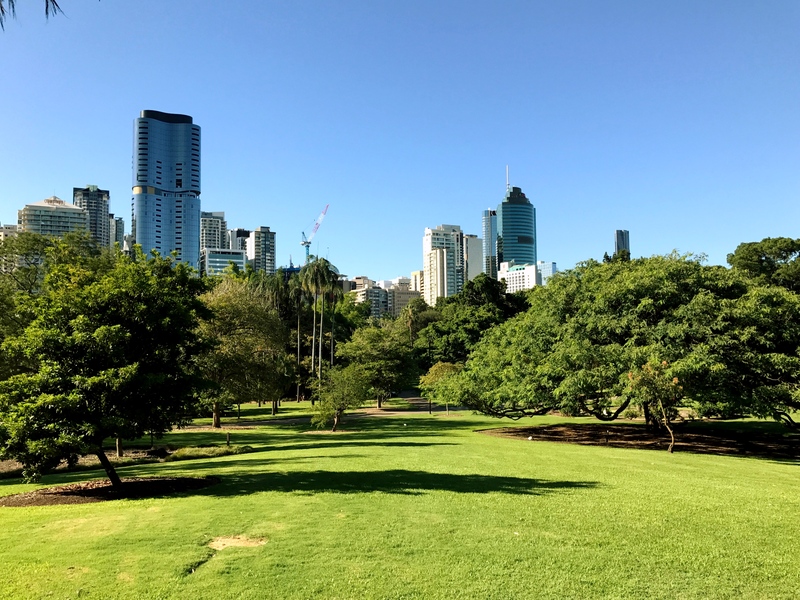 The Botanical Garden is a real gem, 50 acres of green space listed in Queensland’s Heritage Register as having a continuous horticultural history since 1828, without any significant loss of land area or change in use over that time. It has been Queensland’s primary public park since the 1840s and thus has some impressively old trees and such. Of course you have to thank the prisoners for the old beauty; they’re the ones who planted the original garden, though perhaps not entirely voluntarily. So long as you don’t obsess too much over the number of lashes that presumably went into the park’s origin, it is a world-class place to wander and then sit and read. Then there’s GOMA, the modern art museum, a new addition to the city’s culture having been opened just 10 years ago. Notwithstanding its youth, it is a damned impressive place. 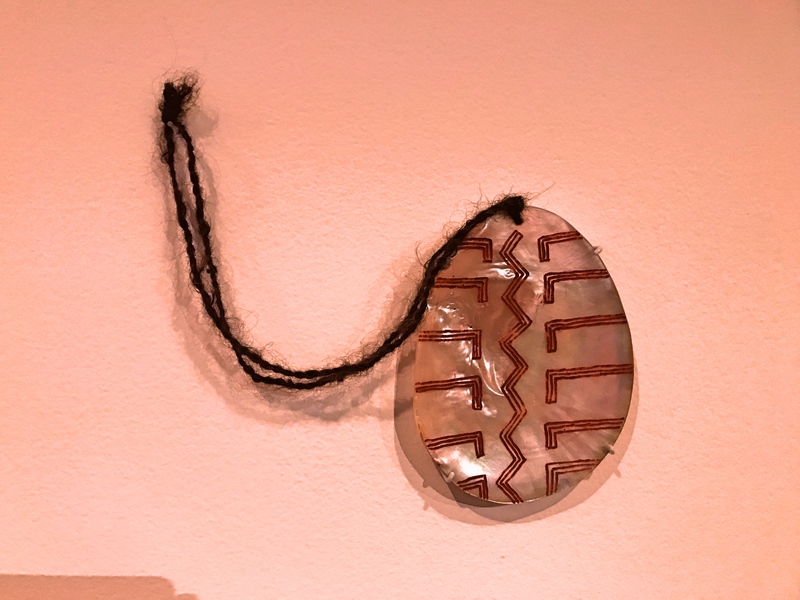 It was a great mixture of focus on indigenous art as well as some pieces from further afield. On top of that we found the descriptions of the various pieces really helpful. And the museum had a remarkable focus on engaging children and encouraging their participation. Finally, there was the Greek restaurant. We’ve been surprised at how comparatively expensive restaurants have been in both New Zealand and Australia. Imagine our delight, then, to find this great Greek taverna in a hip, buzzy neighborhood with rock bottom prices. And, to make it just about perfect, they don’t sell alcohol there at all, presumably because of some zoning limitations. There is, though, a liquor store a block away and for a $2.00 corkage they’ll let you buy your wine and bring it into the restaurant. Thus a meal there was literally half the cost of what we’d spend pretty much anywhere else for similar quality. That’s a memory worth keeping! 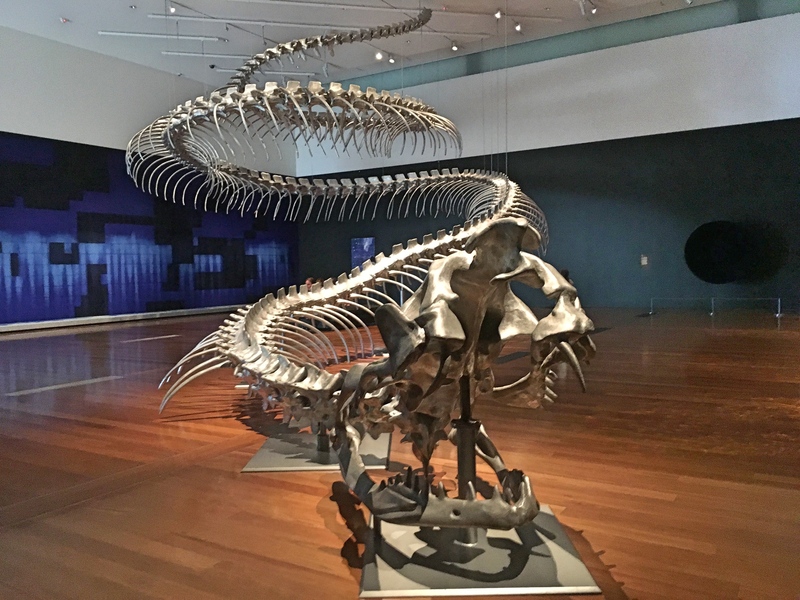 Here are some of our favorites from GOMA. This snake is by a Chinese artist, based in Paris since 1989 (presumably a refugee from the Tiananmen Square massacre), representing resilience, energy, wisdom, and temptation. 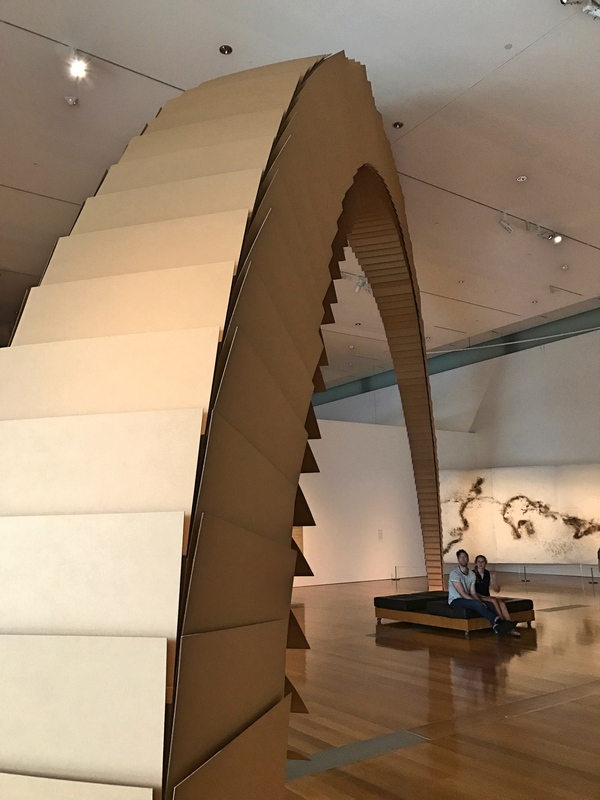 Tobias Putrid is a Slovenian artist who built this arch – explicitly modeled on the Gateway Arch of St. Louis – of precisely sized cardboard boxes. The point was to demonstrate the paradox of an arch’s solidity and permanence when it’s made of cardboard. 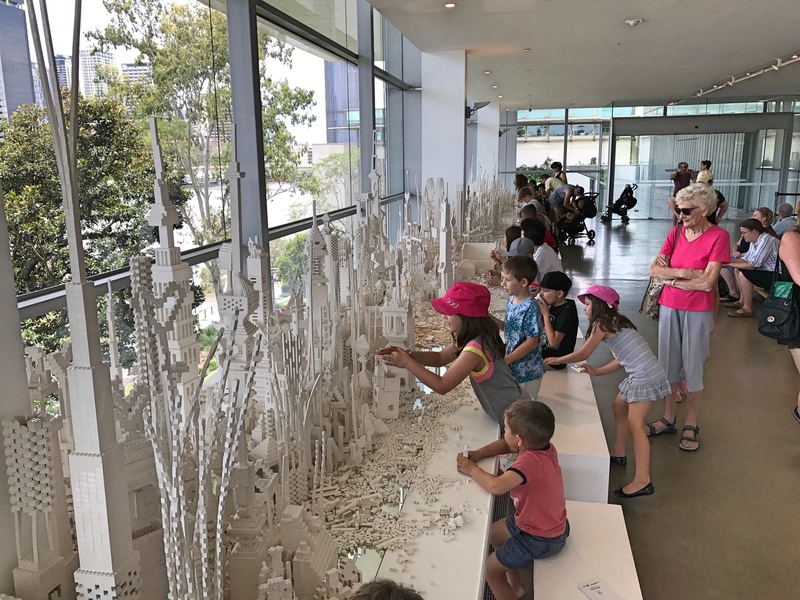 Throughout the museum there were space for children to engage. Here they’re building Lego stuff, while in another part an installation was a couple of slides that had long lines of children waiting for their chance to experience art first hand. 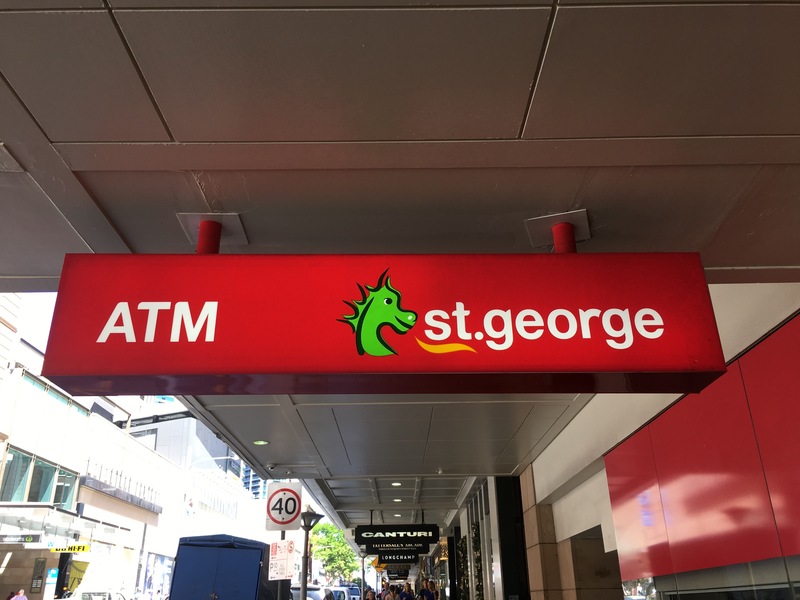 Imagine my surprise to learn that one of the major banks in Brisbane is St. George Bank. For once I could use my name on a restaurant reservation and people would immediately recognize it. 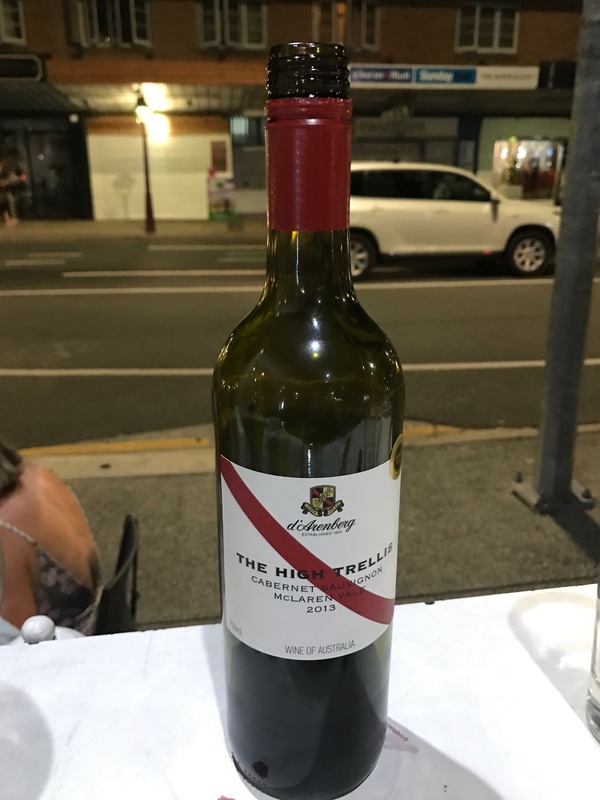 Not exactly great art here, but this BYO wine at our favorite Greek taverna represents a couple great, budget-friendly meals!